SHREVEPORT, LA — Centenary College will explore a holiday theme of light and stars through its annual Christmas Candlelight Service at Brown Chapel on Friday, December 7. Gathering music begins at 5:30 p.m. and a program of Lessons and Carols begins at 6:00 p.m. The service is free and open to the public. Broderick will preside at the service along with Centenary president Dr. Christopher L. Holoman and Centenary College Choir director Dr. David Hobson. Centenary students and faculty will read scripture. The music and special lighting effects will move the participants from darkness to light throughout the service. Music is the heart of the annual service, including both choral performances and congregational carol singing. The Centenary College Choir, under the direction of Dr. David Hobson, and Camerata, under the direction of Dr. Cory Wikan, will be accompanied by organist Dr. Hollice Watson and the Candlelight Brass group. A reception follows the service in the lobby of the College’s Magale Library. 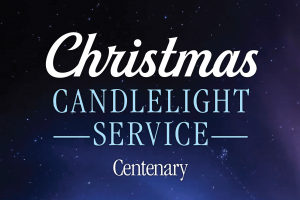 For more information about the Christmas Candlelight Service, please contact Chaplain Lindy Broderick at lbroderick@centenary.edu or 318.869.5112.